True Slopeside Accommodation in one of the best locations in the Whistler Resort . The “Aspen’s on Blackcomb”in the Upper Village Blackcomb Mountain area of the resort is one of the most popular locations for families due to it’s very close proximity to lifts, ski school and village amenities. From the Aspen’s courtyard you are a 1 minute ski down to the high speed Wizard Chairlift. If we are booked for the dates you require we have an additional 2 bedroom condo available, 2nd floor. This deluxe air conditioned ground floor 2 bedroom, 2 full bathroom condo enjoys wonderful direct views to the slope & high speed Wizard chairlift from the main living area and private patio. Bed Configuration: 2 bedroom Comprising of 1 spacious master bedroom with king sized bed , one ensuite bathroom with heated floors and quality fixtures. The second bedroom in this property has 2 double beds, TV, complimented by a second full bathroom with over-sized shower and heated floors. Located on the outer side of complex away from Hot tub noise. The full kitchen has all stainless steel appliances, open style living area with dining table seating 6 people, NEW LCD Flat screen TV, VCR, CD Player, complimentary wireless internet access for all of our guests. The private patio has a gas BBQ, and direct views to the slope. 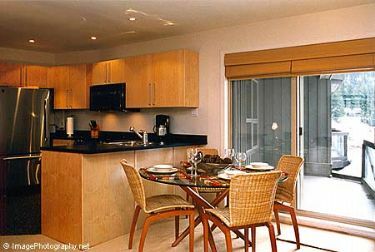 We have an additional luxury one bedroom condo available next door which sleeps 2-4…….please ask for details or view this link: http://www.deluxeaspensonblackcomb.directvacations.com This allows larger families and/or groups to stay next door to each other. The Aspen’s on Blackcomb has wonderful facilities which include a new large out door heated pool, 3 hot tub’s, smaller fitness gym, ski shop with full rental facility, ski valet service for all guests, large lobby with open fireplace, secured underground pay parking and the best ski in/out location available. From the courtyard ski to the Wizard chair lift in less than 1 minute, quick access to the ski school, and ski home with ease at the end of your day on the slope. Stroll to Village for apres ski or catch a free shuttle. This property includes a complimentary personal Concierge service that can arrange any aspect of your Whistler stay; with service that starts well before your arrival, no matter how long or short your stay From transportation to the resort, to child-minding to restaurant suggestions and reservations. Your vacation time is valuable and our Concierge is dedicated to taking care of the details so you don’t have to. (Winter season only). Once you arrive at Whistler Village or Vancouver International Airport our Concierge is available to assist you. As this is a private rental our Concierge will ensure your check-in runs smoothly, and available 24 hours a day for questions & assistance. All inquiries please click on Email Us and we will return your email with further details & rates. Please specify your desired dates. Fast easy & secure payment/booking process available using Visa or Mastercard. 25% Deposit Full Balance due 45 days prior to arrival Book with us prior to 15th November for great deals on lift passes & ski school.